Pauline Park is chair of the New York Association for Gender Rights Advocacy (NYAGRA), a statewide transgender advocacy organization that she co-founded in 1998, and president of the board of directors of Queens Pride House, which she co-founded in 1997. Park was elected to the local station board of WBAI Free Speech Radio 99.5 FM on the Justice & Unity slate in Dec. 2015. Park also co-founded Iban/Queer Koreans of New York in 1997 and served as its coordinator from 1997 to 1999, as well as the Out People of Color Political Action Club, the first political club by and for LGBT people of color in New York City, which she co-founded in 2001, serving as co-president of the club from 2007-2010. And she co-founded the Guillermo Vasquez Independent Democratic Club of Queens (GVIDCQ) in July 2002, serving as vice-president from 2002-2004. Park named and helped create the Transgender Health Initiative of New York (THINY), a community organizing project established by the Transgender Legal Defense & Education Fund (TLDEF) and NYAGRA to ensure that transgendered and gender non-conforming people can access health care in a safe, respectful and non-discriminatory manner. And as executive editor, she oversaw the creation and publication in July 2009 of the NYAGRA transgender health care provider directory, the first directory of transgender-sensitive health care providers in the New York City metropolitan area and the first directory of transgender-sensitive health care providers published in print format anywhere in the United States. Park led the campaign for passage of the transgender rights law enacted by the New York City Council in 2002. She served on the working group that helped to draft guidelines — adopted by the Commission on Human Rights in December 2004 — for implementation of the new statute. Park negotiated inclusion of gender identity and expression in the Dignity for All Students Act (DASA), a safe schools law enacted by the New York state legislature in 2010, and the first fully transgender-inclusive legislation enacted by that body, and she is a member of the statewide task force created to implement the statute. She also served on the steering committee of the coalition that secured enactment of the Dignity in All Schools Act by the New York City Council in September 2004. In January 2012, Park participated in the first US LGBTQ delegation to Palestine, a seven-day tour of the West Bank and Israel that included meetings with LGBT- and non-LGBT Palestinians and Israelis. Park did her B.A. in philosophy at the University of Wisconsin-Madison, her M.Sc. in European Studies at the London School of Economics and her Ph.D. in political science at the University of Illinois at Urbana. She was the first student at any University of Illinois campus to win a Fulbright Fellowship for France. 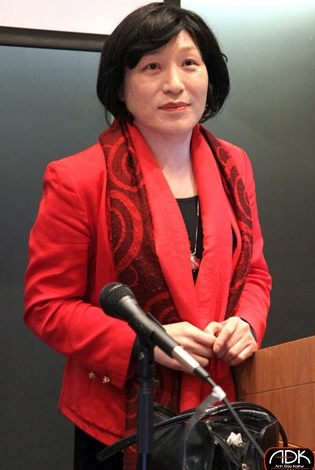 Park has written widely on LGBT issues and has conducted transgender sensitivity training sessions for a wide range of organizations, including the New York State Affirmative Action Advisory Council (AAAC), the Association of Vocational Rehabilitation in Alcoholism and Substance Abuse (AVRASA), the Latino Commission on AIDS, the Park Slope Safe Homes Project, and the Queer Health Task Force at Columbia University Medical School. In addition to presenting at the HIV Grand Rounds lecture series of the Bureau of HIV/AIDS Prevention and Control of the New York City Department of Health and Mental Hygiene, Park co-facilitated the first transgender sensitivity training sessions for any major hospital in New York City at St. Vincent's Hospital Manhattan. Her writings have been published in Lesbian & Gay New York (LGNY), Gay City News, the New York Blade, the Queens Tribune, Sojourner: The Women’s Forum, GLQ: A Journal of Lesbian & Gay Studies, and the Georgetown Journal of Gender & the Law. Park has keynoted numerous conferences, including the Philadelphia Trans-Health Conference (2007), the Women's Leadership Conference of the United Council (University of Wisconsin-Eau Claire, 2005), Asian Pacific American Heritage Month at Oberlin College (2005), A Map of Our Fathers: the Asian American Conference at Smith College (2006), the TransForming Gender symposium at the University of Colorado at Boulder (2006), the National Association of Black & White Men Together (Cleveland, 2007), Expanding the Circle: Creating an Inclusive Environment in Higher Education for LGBTQ Students & Studies (California Institute of Integral Studies, 2010), and the Queer & Asian conference (QACON10) at the University of California at Berkeley (2010). She was also a featured speaker at the New York City LGBT Pride Rally (2006), the Breaking the Silence event at the University of Illinois at Urbana-Champaign commemorating the 2006 National Day of Silence, the first annual Long Island Transgender Day of Remembrance (2005) and the first annual Transgender Day of Remembrance in the state of Iowa (Des Moines, 2010). Park also was the keynote speaker for Columbia University's Lavender Graduation 2011 and Rutgers University's Rainbow Graduation 2011. Park received the Orgullo TransLatina award from the Hispanic AIDS Forum in 2002 and the Pride At Work Award in 2003, and was named to Campus Pride's 2009 hotlist of 'Top 25 LGBT Favorites.' In December 2011, she was named to Velvetpark's 'official top 25 significant queer women of 2011,' which said of her, "The list of Pauline Park's accomplishments in activism and advocacy of transgender rights is nothing short of stellar..."
In 2005, Park became the first openly transgendered grand marshal of the New York City Pride March. In 2015, she was invited to keynote the Queer Korea Festival/Seoul Pride Parade, the largest event in the history of the LGBT community of Korea up until that time, drawing a crowd estimated at more 35,000. She was the subject of "Envisioning Justice: The Journey of a Transgendered Woman," a 32-minute documentary about her life and work by documentarian Larry Tung that premiered at the New York LGBT Film Festival (NewFest) in 2008. The film is now available through Amazon.com. Park is also the subject of "Coming Full Circle: The Journey of a Transgendered Korean Adoptee," a 2016 documentary about her return to Korea in 2015 by Larry Tung that screened at the Asian American International Film Festival in July 2016 and that is available to schools, colleges and universities through Third World Newsreel's catalog. In 2010, Park recorded "Barricades Mystérieuses" -- her first compact disc -- which includes keyboard music by Couperin, Bach, Beethoven, Schumann, Chopin, and Debussy. In 2009, she was designated “a leading advocate for transgender rights in New York” on Idealist in NYC’s ‘New York 40’ list. In October 2012, Park was one of 54 individuals named to a list of "The Most Influential LGBT Asian Icons" by the Huffington Post. In November 2012, she was named to a list of "50 Transgender Icons" for Transgender Day of Remembrance 2012.